Everyone has their own go-to chili recipe and this Vegetable and Heirloom Bean Chili is mine. It’s a little unconventional–not many chili recipes have veggies in them! And most chili recipes are made with the standard black or kidney beans. 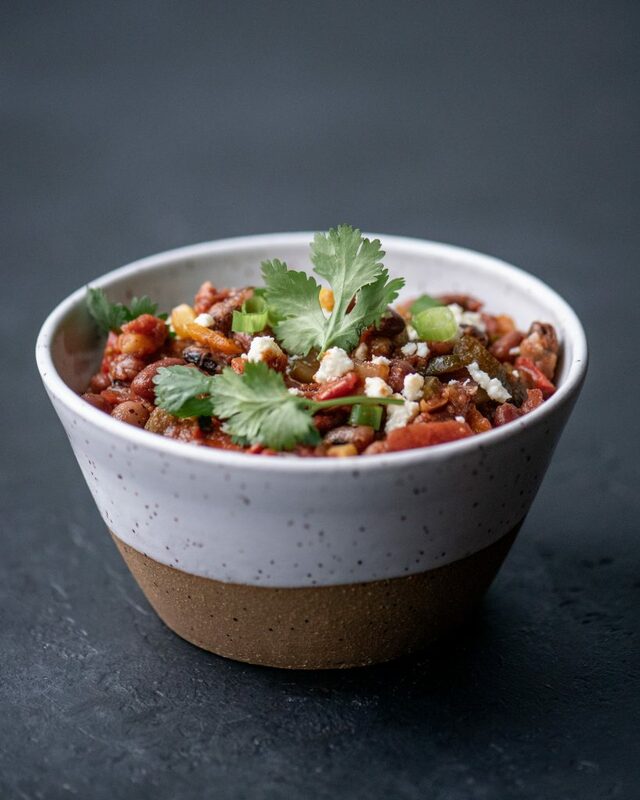 Chili is a dish that lends itself to experimentation, though, and it’s a great opportunity to expand your (bean) horizons. Of course, you can use black or kidney beans in this recipe. They’re perfectly fine! But if you can get your hands on some heirloom beans, use them! You might think beans are beans, but I’ve been surprised at the little nuances in flavor between different varieties. 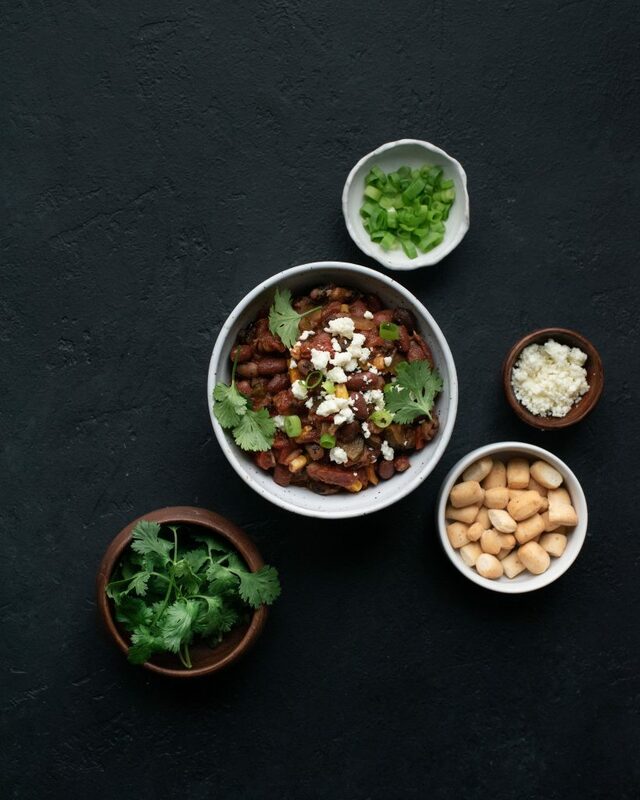 Vaquero beans–the fun black and white guys pictured here–are my absolute favorite for chili because they have a slightly smoky flavor. Unlike canned black beans, they hold their shape and texture once added to chili. The other bean I used I’m not quite sure about–we got a big bag of them in our CSA box and they were simply described as chili beans. 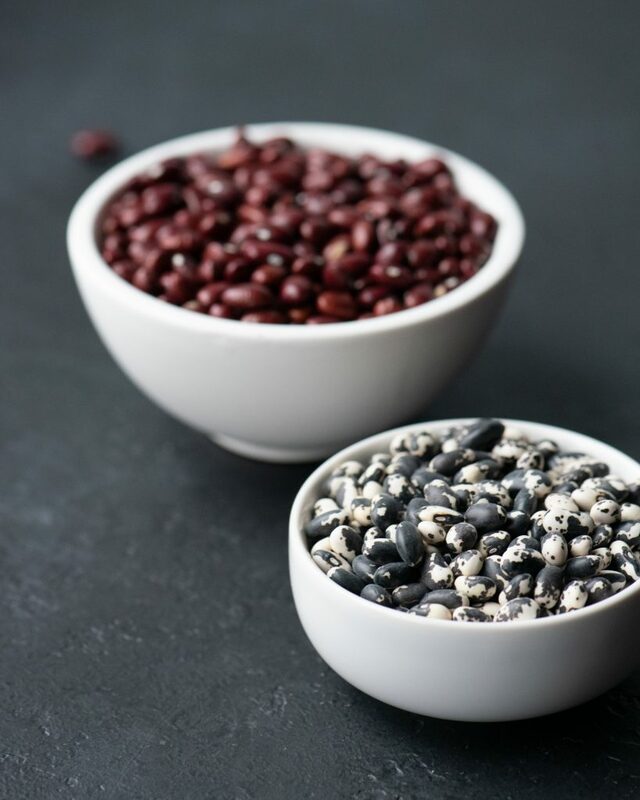 If you can’t find heirloom beans at your local grocery store, Rancho Gordo has a fantastic online shop that not only has a bunch of beautiful, uncommon varieties, but also offers tips on which beans work best for which types of recipes. If you like your chili hearty, not soupy, this recipe is going to be your new favorite. Heat the oil in a Dutch oven over medium heat. Add the onion and cook until it’s softened, 5-7 minutes. Add the jalapeño, garlic and spices, and cook until fragrant, about 1 minute. Stir in the zucchini, and bell pepper. After a minute or two of stirring, add the beans, tomatoes, water or broth, corn, and tomato paste. Bring the chili to a boil, then reduce the heat to low and simmer for 20 minutes. Season with salt and pepper to taste, then divide into bowls and garnish as desired. Use a single variety of heirloom beans or two; a heaping 1/2 cup of dried beans is about 1 1/2 cups cooked. Canned beans can be substituted as well--you'll need 2 cans of beans, drained and rinsed.